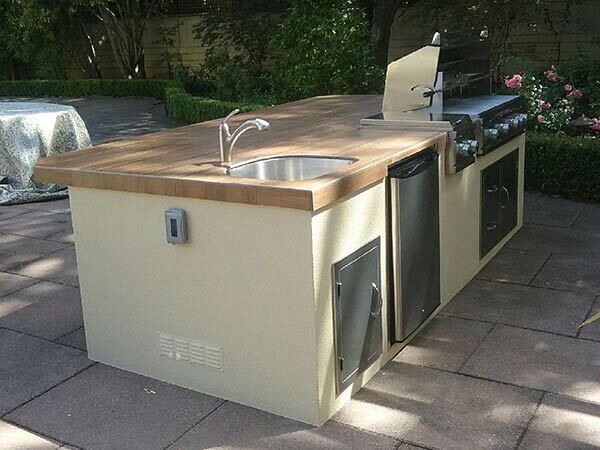 Once you've made the big decision to have an outdoor kitchen installed, you'll soon be faced with what feels like 1,000 other decisions: which countertop will look the best and withstand the elements? Which siding option will match your home? What's the right mix of appliances for an efficient kitchen? Do you need a wet zone with a sink and how will the plumbing work? Sink and Faucet Finishes: When it comes to your outdoor kitchen sink, you can't go wrong with a 304-grade stainless steel basin, which is a very durable and hygienic solution. For the faucet, you want something with a physical vapor deposition (PVD) finish; the best option is a solid brass faucet with a PVD finish and ceramic disk valves. Water Temperatures: Before you spend more than you need to, ask yourself, "Do I really need both hot and cold water in my outdoor kitchen sink?" Having hot water in your outdoor kitchen is more of a luxury than a necessity, so we suggest you only have cold water plumbing installed. But if you do want hot water, an on-demand water heater is probably your best option. You can tie your outdoor kitchen plumbing to your home's waste water system—which will allow you to use a garbage disposal. You can have the water drain into a French drain or dry well—which is convenient, but you won't be able to rinse food down your drain because it will stink up your yard as it rots away. You can simply have the grey water drain into a bucket—which will allow you to recycle the water in your garden. Prepping for a Freeze: When temperatures start to drop, you'll have to be sure you winterize your outdoor kitchen plumbing before you have to face frozen pipes. You'll likely be able to turn off the water with a valve inside your home, and from there you'll have to drain the pipes so the water doesn't freeze, expand, then cause the pipe to burst. The plumber that you work with should train you on the exact winterization steps you need to follow, and will be able to answer any other questions you may have. When you're ready to make the most of your backyard with a custom outdoor kitchen, give us a call at (888) 747-4554 or click the banner below to request your free estimate. Still too early in the process to commit? Contact us online to ask anything you'd like, or see what past customers have to say about working with us.